It is not uncommon for automotive manufacturers to team up with seafaring marques in order to create something truly special. Bugatti, Aston Martin and even Lexus have recently partnered with famous yacht makers to reveal gorgeous creations but now it is time for Porsche to dip its toe in salty waters with the stunning GTT 115 Hybrid, a project that involves yacht builders Dynamiq and Studio F.A. Porsche. The latter is perhaps better known Porsche Design watches, sunglasses, shoes and other branded goods, but it applied its design knowledge to both the interior and exterior of this all-aluminium cruiser. Measuring 115-feet in length, there's plenty of room inside for several spacious cabins, which can be finished with carbon fibre and marble detailing throughout, while furnishings can be finished with the same material as the seats in the Porsche 911 R.
Powering the £10million luxury superyacht is a pair of diesel engines and two 20.8kW electric motors that combine to deliver around 12,500hp. 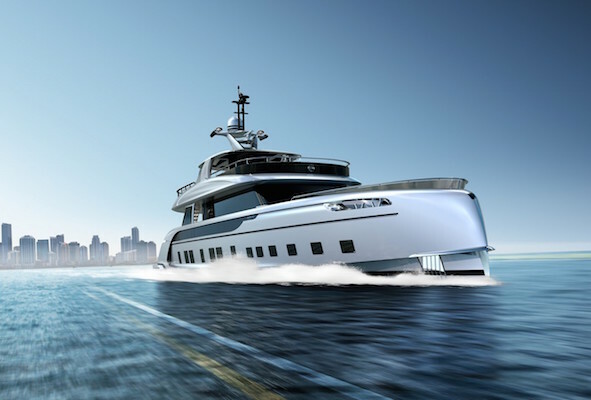 Just seven of these glorious vessels will be created, with Dynamiq planning to create smaller 100-foot and 85-foot versions of the Porsche-inspired yacht. Interested parties should head to the Monaco Yacht Show in September, where the first of the GTT 115 models will be revealed.